Gauguin, Eugène-Henri-Paul (born June 7, 1848, Paris, France - died May 8, 1903, Atuona, Hiva Oa, Marquesas Islands, French Polynesia) was a French painter, printmaker, and sculptor who sought to achieve a primitive expression of spiritual and emotional states in his work. The artist, whose work has been categorized as Post-Impressionist, Synthetist, and Symbolist, is particularly well known for his creative relationship with Vincent van Gogh, as well as for his self-imposed exile in Tahiti, French Polynesia. His artistic experiments influenced many avant-garde developments in the early 20th century. Gauguin was the son of a journalist from Orléans and a mother of Peruvian descent. After Napoleon III's coup d'état, Gauguin and his family moved in 1851 to Lima, Peru; four years later, after the death of his father, the family returned to France. At age 17 Gauguin enlisted in the merchant marine, and for six years he sailed around the world. His mother died in 1867, leaving legal guardianship of the family with the businessman Gustave Arosa, who, upon Gauguin's release from the merchant marine, secured a position for him as a stockbroker and introduced him to the Danish woman Mette Sophie Gad, whom Gauguin married in 1873. Gauguin's artistic leanings were first aroused by Arosa, who had a collection that included the work of Camille Corot, Eugène Delacroix, and Jean-François Millet, and by a fellow stockbroker, Émile Schuffenecker, with whom he started painting. Gauguin soon began to receive artistic instruction and to frequent a studio where he could draw from a model. In 1876 his Landscape at Viroflay was accepted for the official annual exhibition in France, the Salon. He developed a taste for the contemporary avant-garde movement of Impressionism, and between 1876 and 1881 he assembled a personal collection of paintings by such figures as Édouard Manet, Paul Cézanne, Camille Pissarro, Claude Monet, and Johan Barthold Jongkind. Gauguin met Pissarro in about 1875 and began to study under the supportive older artist, at first struggling to master the techniques of painting and drawing. In 1880 he was included in the fifth Impressionist exhibition, an invitation that was repeated in 1881 and 1882. He spent holidays painting with Pissarro and Cézanne and began to make visible progress. During this period he also entered a social circle of avant-garde artists that included Manet, Edgar Degas, and Pierre-Auguste Renoir. Gauguin lost his job when the French stock market crashed in 1882, an occurrence he saw as a positive development, because it would allow him to paint every day. In an attempt to support his family, he unsuccessfully sought employment with art dealers, while continuing to travel to the countryside to paint with Pissarro. In 1884 he moved his family to Rouen, France, and took odd jobs, but by the end of the year, the family moved to Denmark, seeking the support of Mette's family. Without employment, Gauguin was free to pursue his art, but he faced the disapproval of his wife's family; late in 1885 he returned with his eldest son to Paris. Gauguin participated in the eighth and final Impressionist exhibition in 1886, showing 19 paintings and a carved wood relief. His own works won little attention, however, overshadowed by Georges Seurat's enormous A Sunday Afternoon on La Grand Jatte1884 (188486). Frustrated and destitute, Gauguin began to make ceramic vessels for sale, and that summer he made a trip to Pont-Aven in the Brittany region of France, seeking a simpler and more frugal life. After a harsh winter there, Gauguin sailed to the French Caribbean island of Martinique with the painter Charles Laval in April 1887, intending to live like a savage. His works painted on Martinique, such as Tropical Vegetation (1887) and By the Sea (1887), reveal his increasing departure from Impressionist technique during this period, as he was now working with blocks of colour in large, unmodulated planes. Upon his return to France late in 1887, Gauguin affected an exotic identity, pointing to his Peruvian ancestry as a element of primitivism in his own nature and artistic vision. In the summer of 1888 Gauguin returned to Pont-Aven, searching for what he called a reasoned and frank return to the beginning, that is to say, to primitive art. He was joined there by young painters, including Émile Bernard and Paul Sérusier, who also were seeking a more direct expression in their painting. Gauguin achieved a step towards this ideal in the seminal Vision After the Sermon (1888), a painting in which he used broad planes of colour, clear outlines, and simplified forms. Gauguin coined the term Synthetism to describe his style during this period, referring to the synthesis of his paintings' formal elements with the idea or emotion they conveyed. Gauguin acted as a mentor to many of the artists who assembled in Pont-Aven, urging them to rely more upon feeling than upon the direct observation associated with Impressionism. Indeed, he advised: Don't copy too much after nature. Art is an abstraction: extract from nature while dreaming before it and concentrate more on creating than on the final result. Gauguin and the artists around him, who became known as the Pont-Aven school, began to be decorative in the overall compositions and harmonies of their paintings. Gauguin no longer used line and colour to replicate an actual scene, as he had as an Impressionist, but rather explored the capacity of those pictorial means to induce a particular feeling in the viewer. Late in October 1888 Gauguin traveled to Arles, in the south of France, to stay with Vincent van Gogh (partly as a favour to van Gogh's brother, Theo, an art dealer who had agreed to represent him). Early that year, van Gogh had moved to Arles, hoping to found the Studio of the South, where like-minded painters would gather to create a new, personally expressive art. However, as soon as Gauguin arrived, the two volatile artists often engaged in heated exchanges about art's purpose. The style of the two men's work from this period has been classified as Post-Impressionist because it shows an individual, personal development of Impressionism's use of colour, brushstroke, and non-traditional subject matter. For example, Gauguin's Old Women of Arles (1888) portrays a group of women moving through a flattened, arbitrarily conceived landscape in a solemn procession. As in much of his work from this period, Gauguin applied thick paint in a heavy manner to raw canvas; in his rough technique and in the subject matter of religious peasants, the artist found something approaching his burgeoning primitive ideal. Gauguin had planned to remain in Arles through the spring, but his relationship with van Gogh grew even more tumultuous. After what Gauguin claimed was an attempt to attack him with a razor, van Gogh mutilated his own left ear. Gauguin then left for Paris after a stay of only two months. After finding Pont-Aven spoiled by tourists, Gauguin relocated to the remote village of Le Pouldu. There, in a heightened pursuit of raw expression, he began to focus upon the ancient monuments of medieval religion, crosses, and calvaries, incorporating their simple, rigid forms into his compositions, as seen in The Yellow Christ (1889). While such works built upon the lessons of colour and brushstroke he learned from French Impressionism, they rejected the lessons of perspectival space that had been developed in Western art since the Renaissance. He expressed his distaste for the corruption he saw in contemporary Western civilization in the carved and painted wood relief Be in Love and You Will Be Happy (1889), in which a figure in the upper left, crouching to hide her body, was meant to represent Paris as, in his words, a rotten Babylon. As such works suggest, Gauguin began to long for a more removed environment in which to work. After considering and rejecting northern Vietnam and Madagascar, he applied for a grant from the French government to travel to Tahiti. Gauguin arrived in Papeete in June 1891. He came with a romantic image of Tahiti as an untouched paradise, derived in part from Pierre Loti's novel Le Mariage de Loti (1880). Disappointed by the extent to which French colonization had actually corrupted Tahiti, he attempted to immerse himself in what he believed were the authentic aspects of the culture. He employed Tahitian titles, such as Fatata te miti (1892; Near the Sea) and Manao tupapau (1892; The Spirit of the Dead Watching), used Oceanic iconography, and portrayed idyllic landscapes and suggestive spiritual settings. In an attempt to further remove himself from inherited Western conventions, Gauguin emulated Oceanic traditions in his sculptures and woodcuts from this period, which he gave a deliberately rough-hewn look. Gauguin returned to France in July 1893, believing that his new work would bring him the success that had so long eluded him. More so than ever, the outspoken artist affected the persona of an exotic outsider, carrying on a famous affair with a woman known as Anna the Javanese. In 1894 he conceived a plan to publish a book of his impressions of Tahiti, illustrated with his own woodcuts, titled Noa Noa. This project and a one-man exhibit at the gallery of Paul Durand-Ruel met with little acceptance, however, and in July 1895 he left France for Tahiti for the final time. Before the 1890s Gauguin flattened his imagery with sometimes unsuccessful results, but throughout that decade his primitivism became less forced. The influences of J.-A.-D. Ingres and Pierre Puvis de Chavannes led him to create increasingly rounded and modeled forms and a more sinuous line; as a result, Gauguin's images became more luxuriant and more naturally poetic as he developed marvelously orchestrated tonal harmonies. He achieved the consummate expression of his developing vision in 1897 in his chief Tahitian work, Where Do We Come From? What Are We? Where Are We Going? (1897). An enormous contemplation of life and death told through a series of figures, beginning with a baby and ending with a shriveled old woman, the work is surrounded by a dreamlike, poetic aura that is extraordinarily powerful. 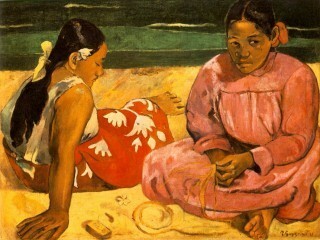 Gauguin's influence was immense and varied. His legacy rests partly in his dramatic decision to reject the materialism of contemporary culture in favour of a more spiritual, unfettered lifestyle. It also rests in his tireless experimentation. Scholars have long identified him with a range of stylistic movements, and the challenge of defining his oeuvre, particularly the late work, attests to the uniqueness of his vision. Along with the work of his great contemporaries, Cézanne and van Gogh, Gauguin's innovations inspired a whole generation of artists. In 188990 many of the young followers who had gathered around him at Pont-Aven utilized Gauguin's ideas to form the Nabis group. The Norwegian painter Edvard Munch owed much to Gauguin's use of line, and the painters of the Fauve groupHenri Matisse in particularprofited from his use of colour in their own daring compositions. In Germany, too, Gauguin's influence was strong in the work of German Expressionists such as Ernst Ludwig Kirchner. Gauguin's use of Oceanic iconography and his stylistic simplifications greatly affected the young Pablo Picasso, inspiring his own appreciation of African art and hence the evolution of Cubism. In this way, through both his stylistic advances and his rejection of empirical representation in favour of conceptual representation, Gauguin helped open the door to the development of 20th-century art. View the full website biography of Gauguin Eugène-Henri-Paul .